Does "No Budget, No Pay" Actually Exist? Does “No Budget, No Pay” Actually Exist? 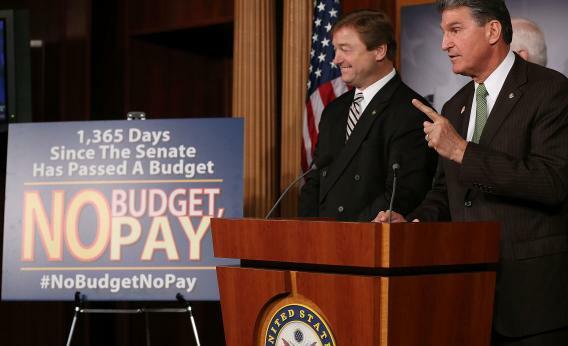 WASHINGTON, DC - JANUARY 23: Sen. Dean Heller (R-NV) (L) and Sen. Joe Manchin (D-WV) speak about the ”No Budget No Pay” legislation during a news conference on Capitol Hill, January 23, 2013 in Washington, DC. It would, but Republicans thought about that. Last Friday, a Boehner spokesman explained to me that a failure to pass a budget would put senators’ paychecks in escrow. They would not get paid until they passed a budget – or until the end of this Congress, whichever comes first. The only way to enforce a No Pay rule would be to pass it now and make it apply to the 114th Congress. That hasn’t happened yet.